A script is basically the backbone of plays, movies, and TV serieses. 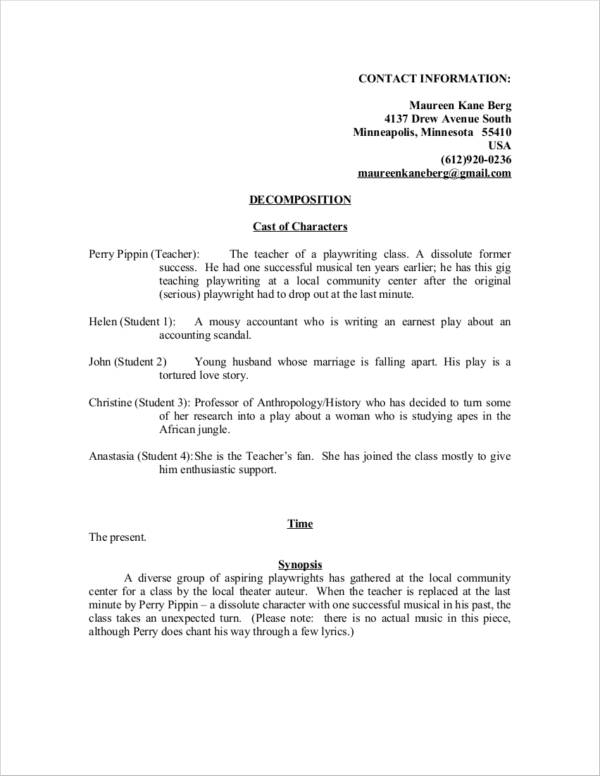 Scripts provide details about scenarios, character emotions, and dialogues of each character. Anything that is written is basically a script. If you want to know more about scripts and how to come up with them, we have a couple of tips to share and a couple of scriptwriting samples and templates that will give you a wider perspective with regards to how scripts typically look like. Scripts are the best tools for making sure that navigating through scenes of plays, movies, or TV can be done in a proper manner. 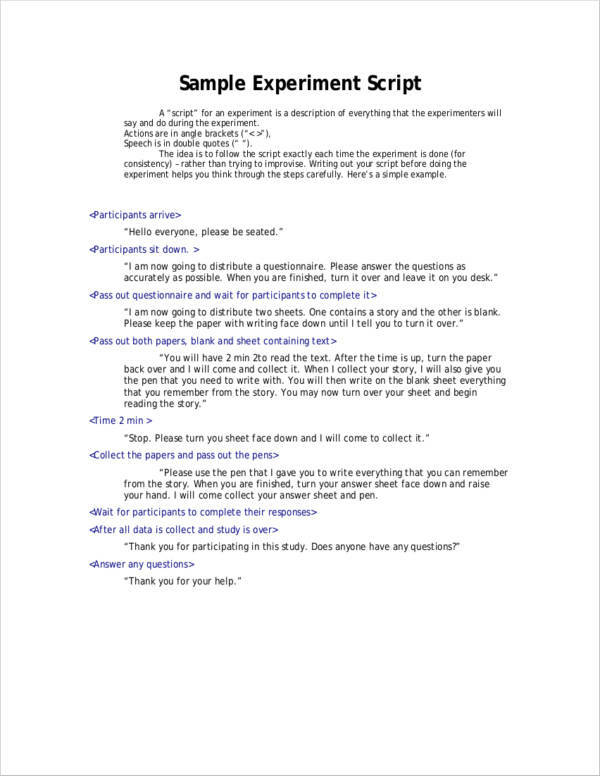 You may also see abstract writing samples and templates. 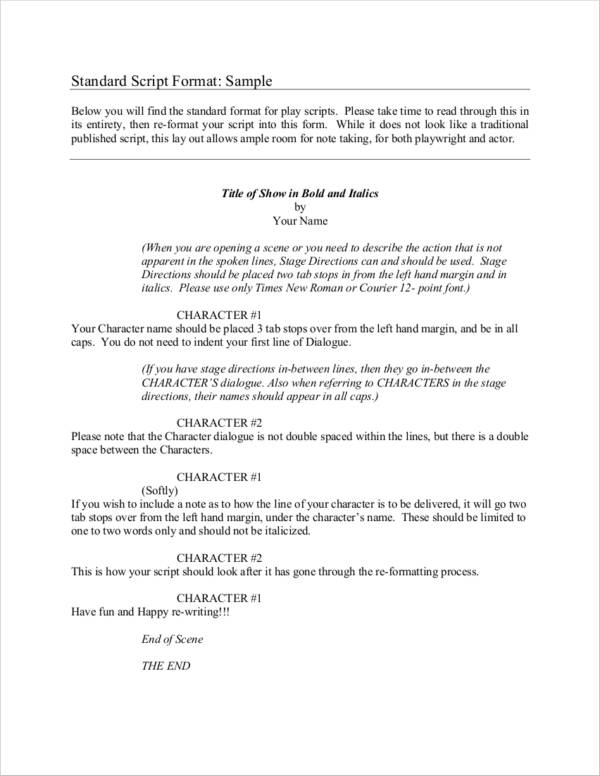 To come up with a good script, whether for a stage play or for TV, we have a guideline on how you can write a script that you can easily follow. Make use of Courier New font style and a 12 point font size when writing your script. Have page breaks in between scenes or chapters. Keep margins between 0.50″ to 1″. Use proper indention to differentiate dialogues between characters. Details About the Characters and Settings. Make use of slug lines. Slug lines are statements that help direct the reader’s attention to important aspects of a scene. Pauses and instructions can be placed in parentheses while character names should be in all caps. 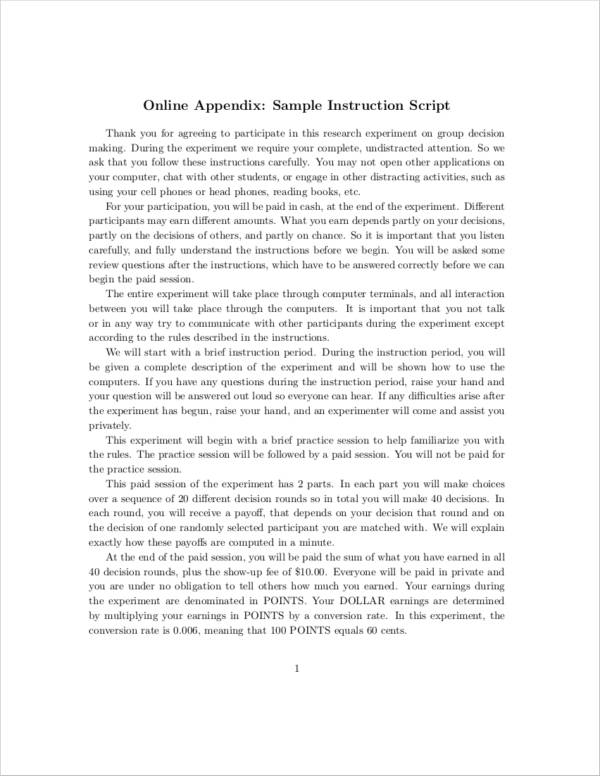 You may also like article writing samples & templates. Make Use of Proper Formatting. Determine what type of script you are writing. 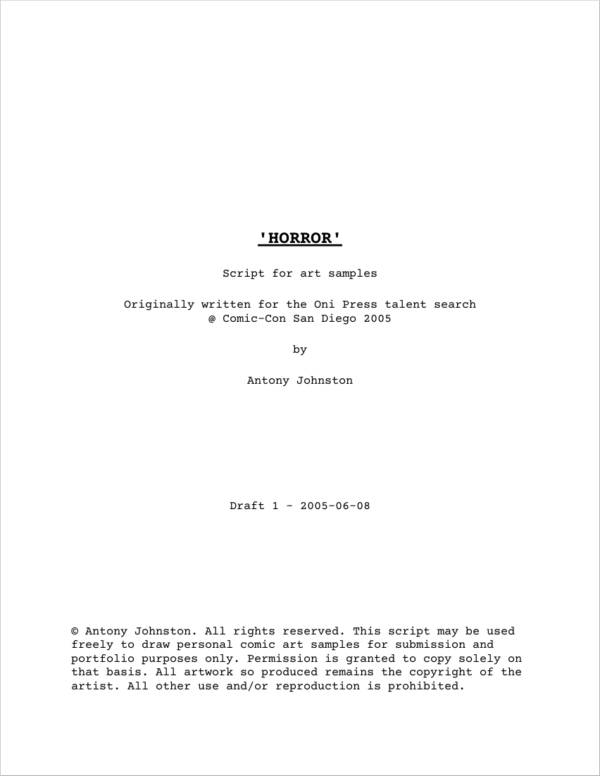 If you are writing a script for a movie, make sure you follow the format of a movie script. Same goes if you are writing a script for a screenplay, follow a format for screenplays. More information about writing for screenplay at Screenplay Samples. Do research about the type of script that you would like to write to learn more about how you should attack your own script. Write Enough. Make sure that you do not write too much and that you also do not write too little. Scripts will usually last about a minute per page. Start with the Premise. The premise is the concept that the story revolves around. This can either be the message of your story or the idea that the reader should look forward to. Come up with an Outline. Your story outline will basically be the map of the story. It will show what the sequence of the story will be that will lead to the plot and the main message of the story. This is usually written in third-person perspective. Write the Details of Your Story. Include all the details about the characters and ideas. There is no need for you to think about formatting. Instead, think about milking out all of the details that your characters and scenarios have. You can even make use of a professional storyboard template to ensure that you are able to get your story straight. Do Some Research First. Watch TV shows, plays, and movies. Compare your work with what you are researching and see if you are in line with what you have written. 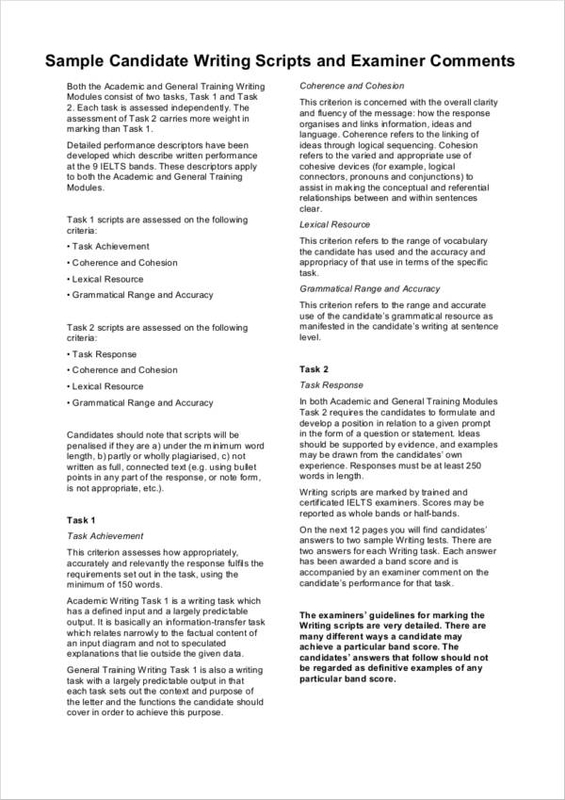 You may also check out business writing samples & templates. Simplify. There is no need for you to make use of complicated words. Fancy dialogues and crazy scenes should be left out unless they are needed in your story. Write Everything in Script Format. This includes the plot. 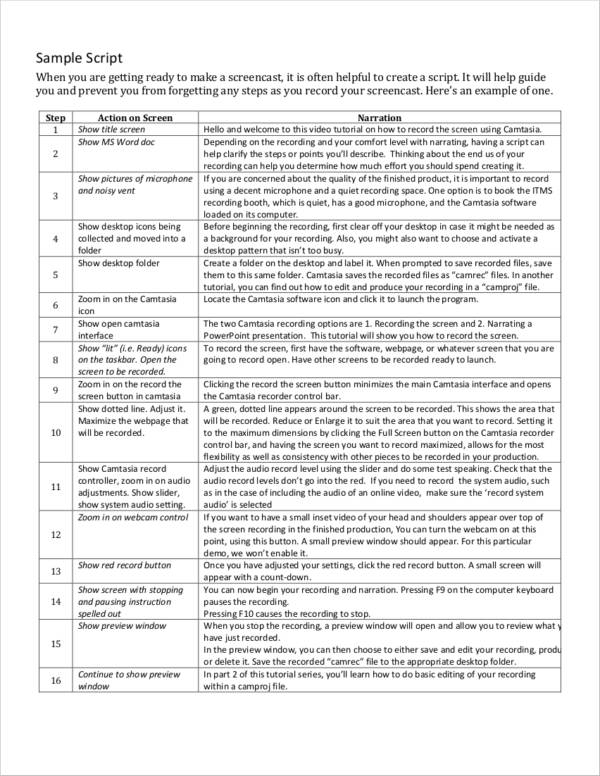 Make use of proper headings and subheadings in order to introduce scenes and speakers. You might be interested in free writing samples. Be Consistent. Make sure that your formatting and writing style is consistent all throughout your script. Give out the Details of Your Scene. Include all important details such as the time of day, setting, and the mood of the characters. These details, as simple as they may be, set the mood of the scene. 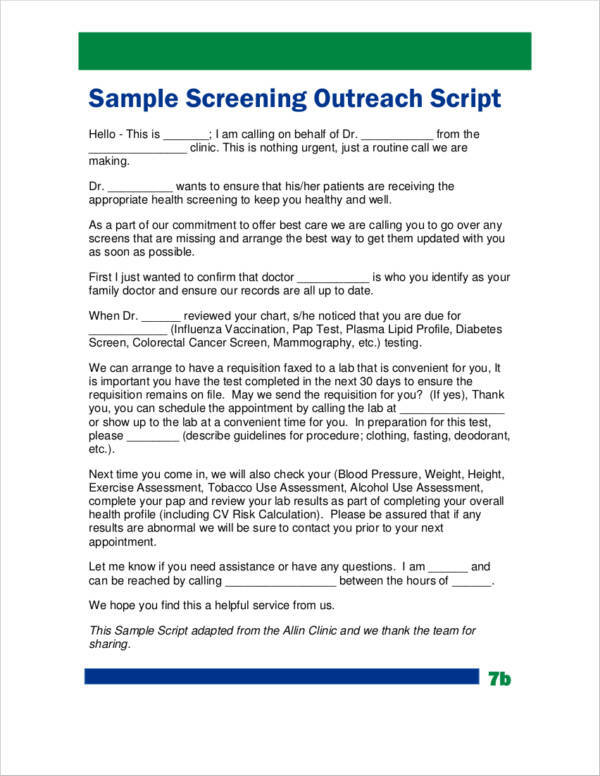 You may also see script samples and templates. Brief Descriptions of the Actions. Make sure that the actions are brief. Give the reader a good sense of what is happening in specific scenes. Work on the Dialogue. Take your time in developing your characters’ dialogue. Since you are briefly explaining the scenes, you want to make sure that your characters’ dialogues are the ones that will do all the work for your script. Your characters’ dialogue will build the character’s persona. Read the dialogues aloud and take note of how it sounds and if it will be a good fit for the character that you are developing. Make sure to be wary of your word choices as these affect the development of your character. You may also like screenplay samples. Edit. Edit as much as you can. Just because you fell in love with certain scenes, characters, or dialogues does not mean that you cannot edit it out. Look at your script in an objective manner. If you are having a hard time doing so, you may ask someone to read your script and ask for suggestions for improvement. You may also see book writing samples. Remember that when asking others to read your script, you should not be offended or insulted. Do not take it too personally. Remember, we are working towards making your script close to perfection. Take note to ask different people from different backgrounds to read your script. Revise as Many Times as Possible. Be ready to do revisions multiple times. Prepare Your Script for Submission. Prepare a cover letter to submit alongside your script. 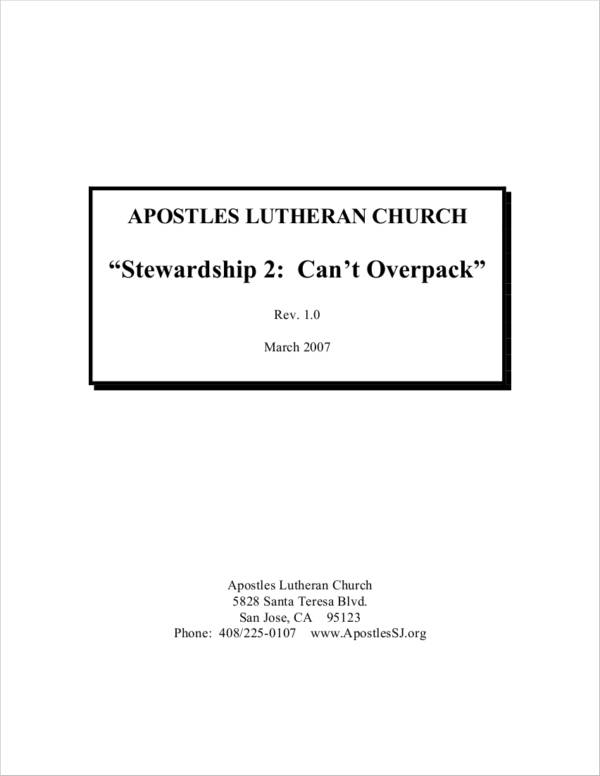 You may also like commentary writing samples and templates. Always remember the type of script that you are writing and stick to the format recommended for the type of script. Do not make your script sound robotic. Make it sound like a conversation instead. Do not be afraid to take a scriptwriting class if you feel like there’s a need for you to improve your scriptwriting skills. Taking a class will help you develop your plots better, come up with appropriate dialogues, format your scripts properly, and make your character’s persona a good fit for the story. You may also like biography writing samples and templates. Make your script original. Take inspiration from other stories and scripts but never copy from original work. See whether you will also be adapting an existing story and turn it into a play or a TV adaptation. Take your time. Do not rush into things. If you have a deadline to follow, you may want to make a daily agenda that can help you make a schedule to ensure that you finish your script before the deadline. Contact an agent if you want your script to be performed on screen or on stage. Why be conventional when you can try being unconventional? Maybe trying it the unconventional way is what will work for you. When it comes to writing scripts, despite the number of times you have revised it, there is actually no guarantee that you will be 100% successful once you are done writing it. However, you want to make sure that it will not get dismissed. But you should not expect your very first script to be picked right away. The entertainment industry is a tough one to break in, so you will definitely receive a heartbreak if you keep expecting to be picked right off the bat with your very first script. With regular practice of writing scripts though, you will eventually get the hang of it and you will be able to write good scripts as if it’s your second nature. 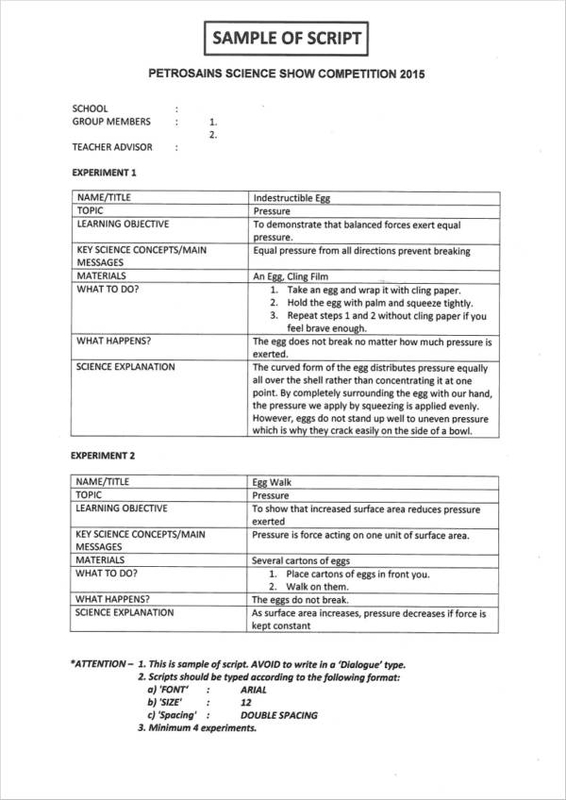 You may also see informational writing samples and templates. As we have mentioned earlier, storyboards can be used to help you make your story more organized and it also enables you to know how your story will go. If you are looking for storyboards that are easy to edit, you may want to check out Storyboard Samples in Word.